This is an interesting twist on the old facebook freebie phenomenon. Olay Canada are running a freebie in celebration of birthdays. While this promotion won’t be open to everyone, it might be a nice surprise to those of you with friends who have a birthday in the months of June, July or August. From their facebook page you can send your friend a free birthday gift from Olay (Olay Pore Minimizing Cleanser & Scrub 150ml). Customers have until June 20th or until the freebie runs out, whichever is sooner. And for some reason customers have to be over the age of 19 and be female. I don’t like the female thing, you wouldn’t see this if it was the other way around. Of course only 1 gift per referred customer (but you can send it to multiple recipients) and the actual freebies are all being shipped out on the 30th June. 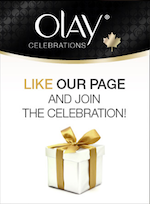 In order to start referring your friends you will need to go to the facebook page of Olay and click on the huge ‘join the celebration’ button, then ‘Like’ the page and after that again click on the ‘start celebrating’ button. Customers can only send the offer to people they are actually friends with on FB, make sure that the person knows that you are sending it them or they may think its spam.